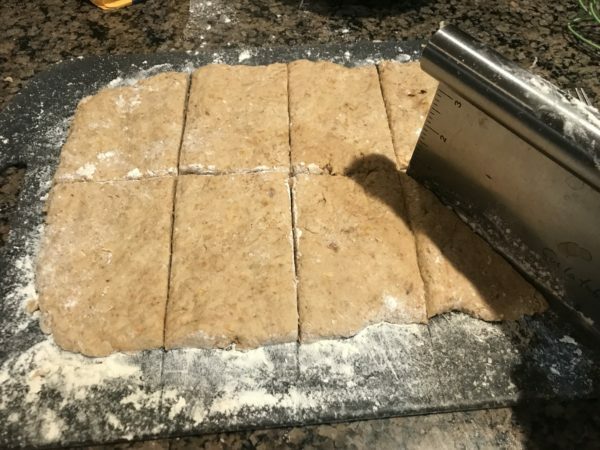 When I made this recipe, I spread out the dough too thinly. The result is tasty, but crispier than I wanted. So, please pay attention to my instructions and not the pictures! 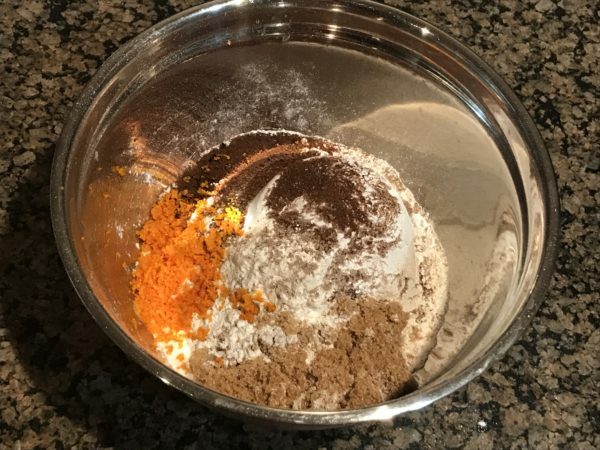 Whisk the flour, baking powder, salt, sugar, espresso powder, and cardamom powder together in a bowl. Zest the skin of the orange into the bowl and whisk that together, too. 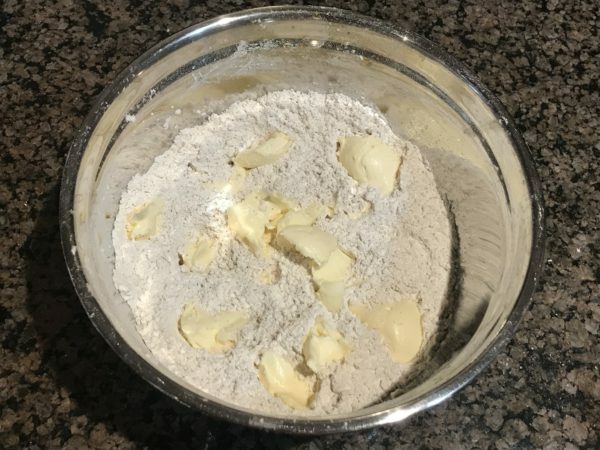 Using a fork, cut in the butter to coat the pieces with the flour. The mixture should look like coarse crumbs. NOTE: the total quantity of orange juice and half-and-half should be 1 cup; if there is less juice from the orange, add some half-and-half to make up the difference. Mix in the juice from the orange. Make a well in the center and pour in the half-and-half. Fold everything together just to incorporate; do not overwork the dough. 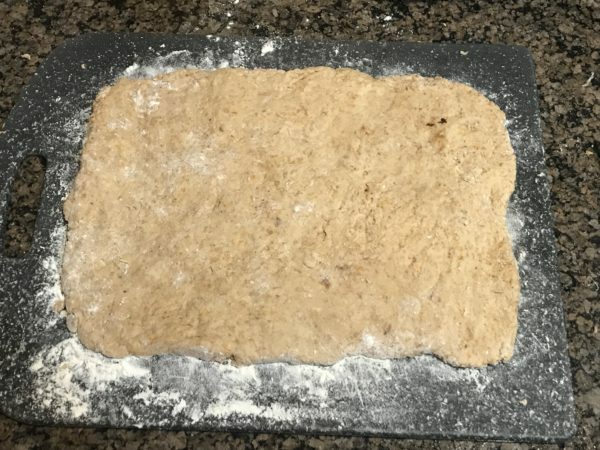 Turn the dough out on a lightly floured surface into a rectangle about 12 inches by 6 inches by 3/4 inch thick. Cut the rectangle in half length-wise, then cut in quarters length-wise, giving you 8 squares. Cut the squares in 1/2 on a diagonal to give you the classic triangle shape. Place the scones on an ungreased cookie sheet and brush the tops with half-and-half. Bake for 12 to 15 minutes. 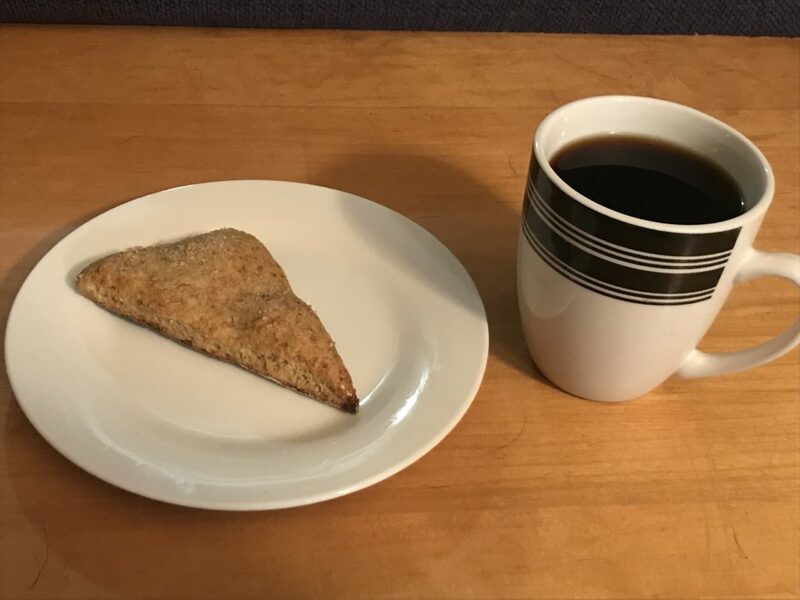 NOTE: it will be hard to judge how done the scones are by browning because of the espresso powder coloration. Remove immediately from baking sheet and place on cooling racks. While the scones are baking, make the glaze by combining confectioner's sugar with a small amount of water. Let the scones cool a bit before applying the glaze. Whisk the glaze to smooth out any lumps, and brush onto the surface of the scones. Sprinkle with turbinado sugar. When I first decided to make a light pancake, I did what I always do: I searched on-line. The first thing I found was a recipe that used oats, bananas, and milk. 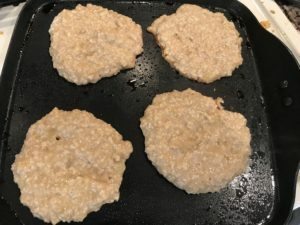 This created something that looked like a pancake, but was spongy and somewhat crunchy because of the oats. Even worse, it was much heavier than what I came up with here: 3 points for 2 “pancakes”, which isn’t terrible, but also not as good as these babies. I spent the first 3 paragraphs of the post on those oat cakes just explaining what they were, since I didn’t really consider them to be pancakes. Then, I decided to start over. I did see recipes that used eggs in what looked like a huge proportion: 2 whole eggs for each banana?? No wonder one reviewer remarked that the pancakes tasted like “banana omelets”. So, I decided to try again, but take out the thing that makes eggs taste “eggy” in a recipe: the yolk. I then went an extra step by whipping the egg whites into a froth to add air to the batter. Finally, one thing I missed in the oat cakes was a total lack of crispness. No matter how long I cooked those, they never got crisp. I know, the first thing you do with pancakes is smother them with syrup, but I want them to be somewhat firm on the surface so they don’t turn into a pile of mush. So, I added a small amount of flour to these. 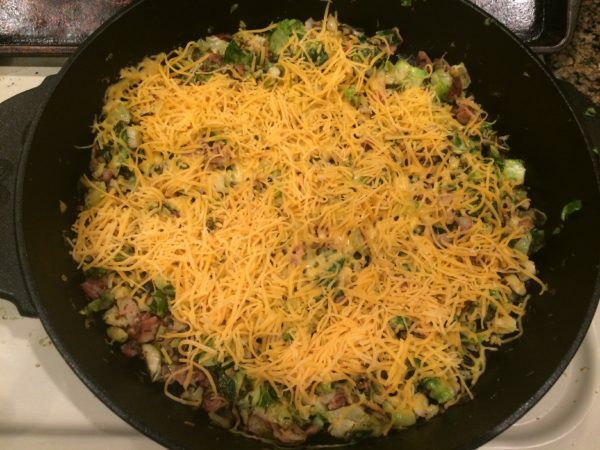 This is the only source of points in the recipe, so you could try excluding it if you like. 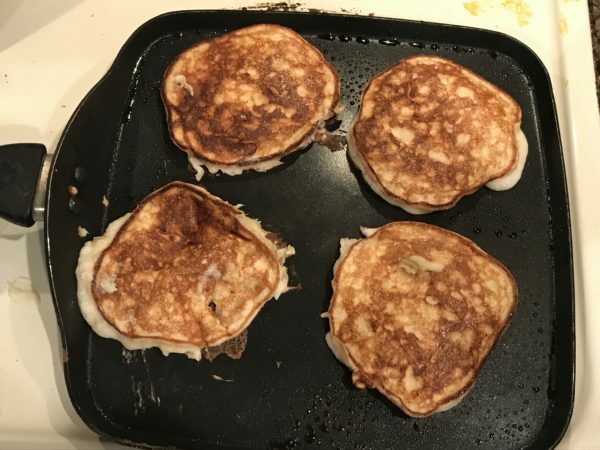 But, they’re only 43 calories this way (compared to about 65 for a regular pancake), and they really do feel like a regular pancake. Wait…there’s more. Some recipes show vanilla extract and sweetener as optional ingredients. I feel that they’re essential. Otherwise, you’ll have a tasteless pancake. Again, I know they you’re going to have them swimming in syrup anyway. But, if you have tasteless pancakes, you might as well just pour the syrup on a plate and eat it that way. You will notice the difference. 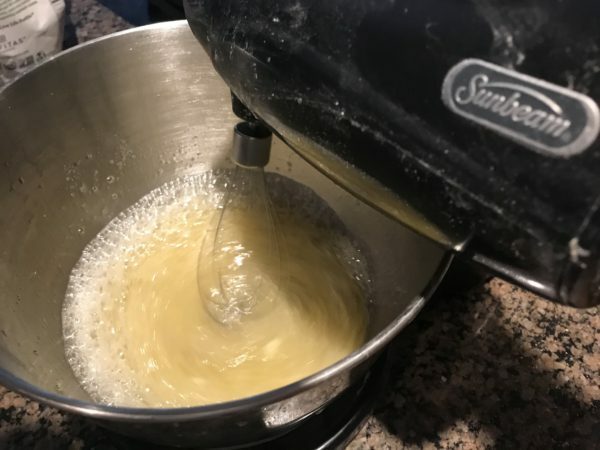 Add egg whites, sweetener, and vanilla extract to a mixing bowl. 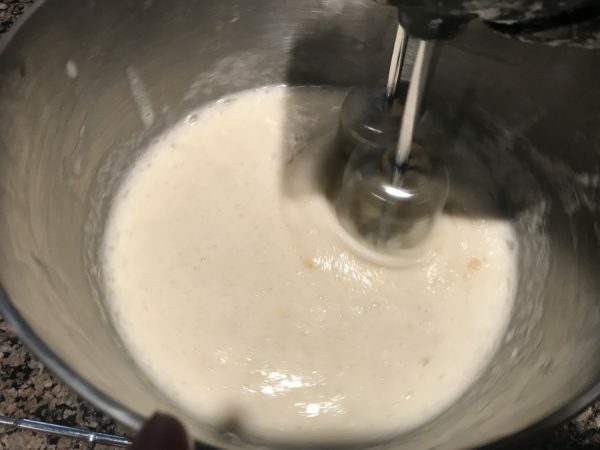 Using a mixer fitted with a whisk attachment, mix until the egg whites are frothy. Mash up bananas and add to the bowl along with flour. Mix using regular mixer attachments. A few small lumps of banana throughout is completely acceptable. Spray whatever surface you plan to cook the batter on with cooking spray. 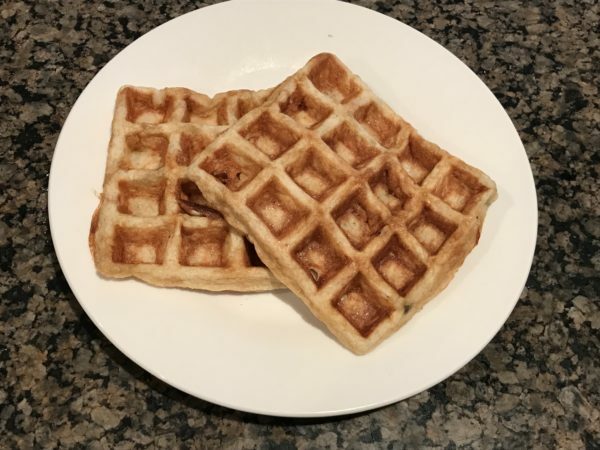 This same recipe also works on waffles, and doesn't seem to require more spray than normal. Place an equal amount of batter in circles that aren't touching. 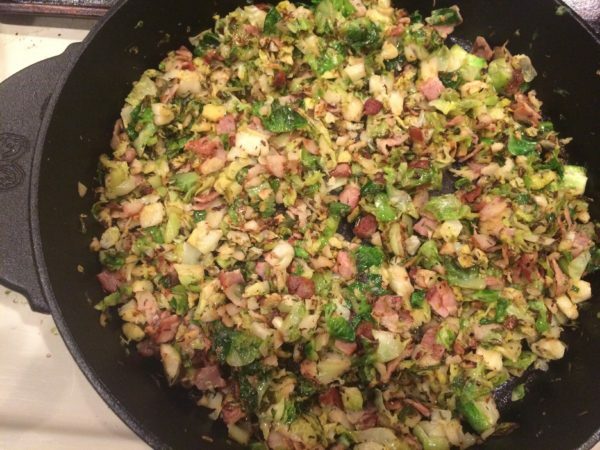 Cook until you start to see a browning along the base. 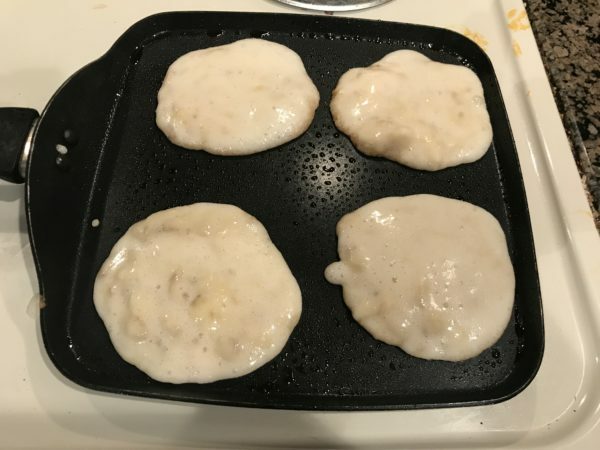 Flip each pancake over carefully: the batter is a bit thinner - and these weigh less - than a regular pancake batter. When done, remove to a cooling rack to keep them from getting soggy, or serve immediately with sugar free syrup (and light butter, if you like). 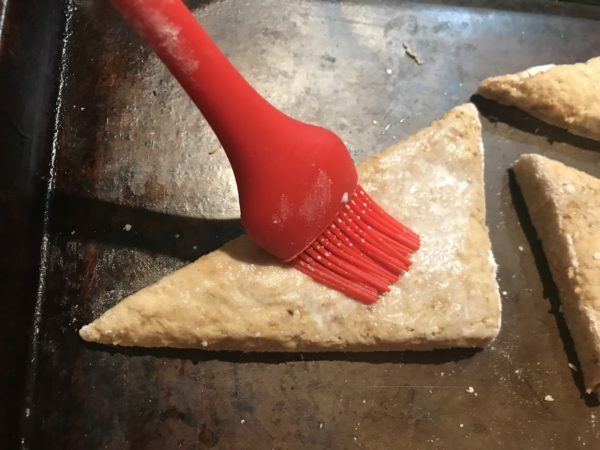 Reapply spray to the surface until the batter is used up. Stack them as high as you want: they're only 43 calories each! If you're making waffles, check to make sure they're done enough for your tastes. Reapply cooking spray between each batch. 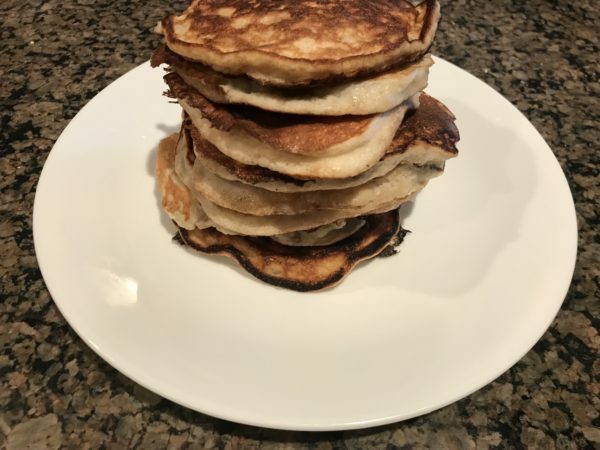 This is what the pancakes looked like when I made them with oats, milk, and bananas. It's lumpy, and those lumps aren't going away. While I now realize I could have fixed the lumpiness by blitzing the oats in a spice grinder, the texture was also off because they never crisped up. 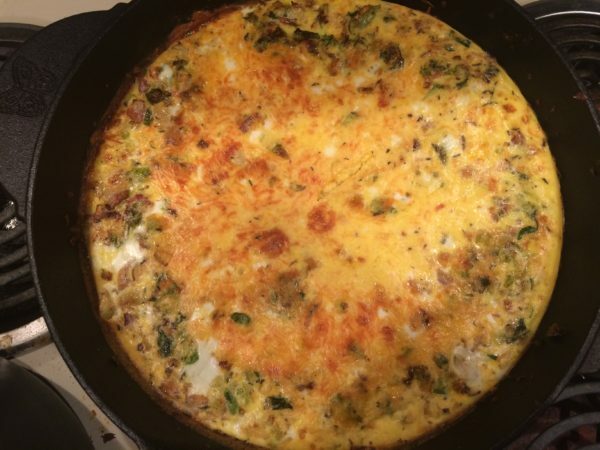 Do yourself a favor and make the recipe like this (with egg whites and no oats) instead.